Some days, if I want to have some fun, I ask my francophone students how many verb tenses there are in English. Their guesses are all over the place, usually somewhere between ten and twenty. And they are guesses; no one is really sure that they know the answer to my question. Of course, since I teach with Comprehensible Input, I don’t intend to deliver a grammar lesson detailing all the complexities of English verbs to my students. What I do want to do is to lower their affective filters by showing them that there is a system to English madness and that it is not nearly as complicated as they think, that actually it’s much simpler than their native French verbs. Many years ago I listened to a French educational expert, Brigitte Trankheim, explain how she used mandalas to help students visualize relationships and systems. 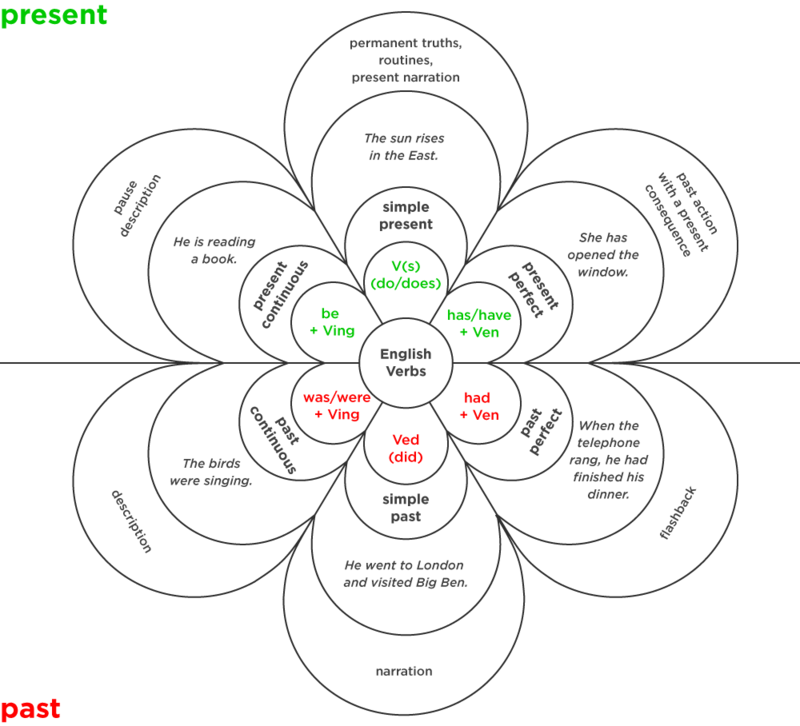 And I came up with a mandala that represented the English verb system. I could just print it and hand it out to my students, but I usually prefer to draw it with them, so that it feels like a group effort. I give them each a blank piece of paper and ask them to hold it upright (portrait position) and draw a horizontal line through the middle. I then explain that according to linguists English has only two tenses: past and present. Immediately they ask about the future and the conditional. I explain that English speakers have many ways of speaking about the future and expressing conditional thoughts, but we do not have tenses for them. I suggest that we consider everything above the line Present and everything below the line Past. In the very center of the line I draw a circle and write V in it. My scientific classes want to know how big the circle is, and I say 2 cm. These are the classes that take out their geometry tools and rulers to be sure their circles are perfectly round and the lines are perfectly straight. My model on the board is lop-sided and usually gets pretty messy. I then explain that of course there are more than two verb forms (that would be too easy, right?) because while there are only two tenses there are three aspects, simple, progressive(or continuous) and perfect. So we have two times three, six verb forms. So we draw three petals above the line and three petals below the line, which gives us an image of a daisy with six petals. I like to use warm colors above the line for the present and cool colors below the line for the past. In each petal I write the auxiliary needed and a representation of the verb form as used by linguists. (do/does) + V(s) in the top middle petal, be + Ving next to it and have/has + Ven on the other side. In the bottom middle petal we write (did) + V(ed). Was/were + Ving next to it and had + Ven next to it. I explain that Ved and Ven are the same thing for regular verbs, but not for all irregular verbs, so Ven represents the third form in their lists of irregular verbs, a form that often ends with –en, but not always. The parenthesis show parts which are not always present. I explain that these are shorthand ways of naming the verb forms used by linguists. And we talk about why it’s V(s) and they can figure out that the –s is used for third person singulars, etc. Then we draw another, larger row of petals, and in this row we put the English name of each verb form above the linguistic shorthand: Simple Present, Present Continuous, Present Perfect, Simple Past, Past Continuous, Past Perfect. In a fourth row of petals, we try to explain how each verb form is used. I use their suggestions whenever possible and make my additions and comments as simple as possible. This entire operation can take an hour of class time, but I usually have everyone very focused throughout because I explain that they will have the right to consult their verb-flower at all times, even during tests. I always tell them that this will be their one and only grammar lesson of the year. I sometimes suggest that they redo it at home, using their own examples and color schemes. In a class of all boys I suggest that they can make it a series of circles instead of flower petals if they wish. Thanks so much to Rachel Salvi and my daughter, Kellie Dubois, for transforming my awful scribble into a lovely visual. I think you have past continuous listed for both past and present continuous. Is the present continuous “has been reading”? Sorry, the print was small on the model I saw and I didn’t notice that “He is reading.” had become “He was reading.” As soon as I can get the artist to change it, I’ll have it corrected. “He has been reading” is the Present Perfect Continuous form, simply a combination of Present Perfect and the Continuous. The students who have understood the system as presented shouldn’t have any trouble understanding that it’s possible to combine the two forms. I’ve now corrected the image. Thanks, Michele, for pointing out the oversight.